Have I told you lately that I love you? Because I do. And I want you to stick around for a long, long time. It's for that reason that I am, as I've said a million times this past week, putting All Kinds of Yumm on a diet. It won't last forever-no New Year's resolution does. But I want one of you to be well-equipped for this, and crock pot cooking is one of the healthiest means of creating a meal. Plus it leaves you more time to go to the gym or start that business you swore you'd open this year. Or you can just take a nap. There's no judgment here. 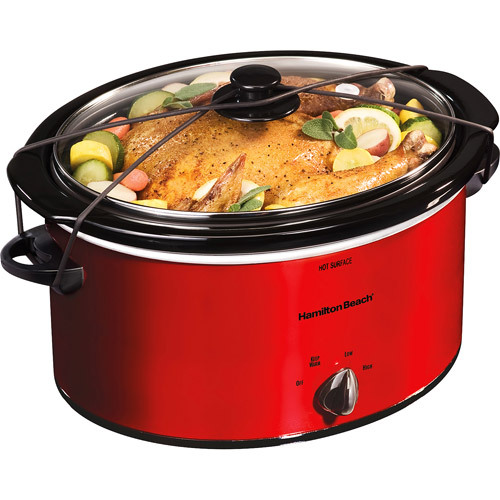 So, in honor of the new year, and as a "thank you" for all your loyalty and readership in 2011, I want to give one of you this beautiful Red Hamilton Beach 5-Quart Portable Slow Cooker. And I'm totally jealous, because I want a red crock pot, but I already have three, and my husband won't let me have any more. What's your favorite crock pot meal? Or do you never cook in a crock pot which is why you desperately need this one? If you win, I'm also going to post your recipe on All Kinds of Yumm. I won't need details until announcing the winner, so don't worry about putting all the instructions in the comments section. Promise. I love to make jambalaya in a crock pot! Chicken, rice, shrimp, sausage, loads of veggies! BTW ...Hope your hand is ok!!! OMW - It looks so sore!!!!!! There are a lot of things I want to try, but I don't have a slow cooker! Please let me find out how they taste!!! Everytime I make these simple sandwiches, they are gobbled up. Ryan's mom taught me how to make this in the crockpot. I served a 6 lb. Roast on New Year's Eve and there were no leftovers. However, my current crockpot has a dent in it from falling off of the refrigerator. I would LOVE a new red one! I've never owned one, but, would really love to. My husband and son love roasts and I think I'd make one right away if I won. Happy New Year! i Have an old one that hubby lost the dial for so we turn it on and off with pliers lol.i guess my favorite thing is homemade meatballs.it also rocks a roast beef and potatoes. I love it for many things, like your daddy's favorite creamy chicken soup (your recipe). My most common is Hobo Stew, with turkey meatballs. Easy, healthy, and it's yummy comfort food! My boyfriend made some AMAZING crock pot ribs! He also made some mouth-watering roast beef in the crock pot and we made sandwiches on toasted sourdough bread with provolone cheese - PARTY IN YOUR MOUTH! My favorite crock pot recipe is Teriyaki Chicken! :) Thank you for sharing your AWESOME recipes. They are so simple to follow and delicious. I never used a crock pot, but if I were to try & cook something it would be pot roast with lots of vegetables. My absolute favorite crock pot meal is a potato soup recipe that I turned into clam chowder! It is crazy good and awful for you. It is fabulous and even my husband can make it! I most often make a killer beef stew in the crock pot, but my favorite is a lemon roasted chicken recipe I got as a wedding gift from my beloved grandma's best friend. So much love there. And Rebecca's Roast Beef Sandwiches are over the top good. I'd love that recipe, too! I don't use our crock pot a ton. It's a hand-me-down from my boss who got a new one. It's got a gigantic chunk taken out of the ceramic near the top. Still works pretty good but a new red crock-pot would be pretty fab! I love crock pots...its a staple in my house. My favorite meal is Flank Steak and veggies in the crock pot. My favorite thing to cook in a crock pot is clam chowder. My favorite thing to cook in my crockpot is deer stew. Its not hard to make and it tastes amazing. I love it because the veggies really get to soak up some deer meat as well so when its ready to eat it tastes awesome. Nothing beats Taco Soup in the crockpot and it's probably the easiest crockpot recipe you will ever make. Nyum, nyum. My favorite was the Crockpot stuffing I did for Thanksgiving this past year. It gave me more room in my oven for cooking other stuff too. I like to cook a roast in the crock pot, with carrots and potatoes and let it cook all day. Complete meal (aside from the gravy I make after). It's quick, easy and I love to watch it fall apart as it goes from the pot to the table. Always a hit. ( http://www.bhg.com/recipe/stews/pumpkin-cider-stew/ ) just throw everything but the pumpkin and apples in the crock pot and leave all day then 20mins before eating throw in pumpkin & apples! One of my FAVORITE RECIPES! My favorite crock pot meal right now is the meat I make for enchiladas. I put a 2 lb roast in the pot with two packs of hot taco seasoning and some chilis. Add enough water to cover, cook 8-10 hrs, remove and shred meat to put in your enchiladas. Enjoy! DEFINITELY desserts!!! I make a bunch of them. luv chocolate molten cake. Chicken ad potatoes are great & easy.